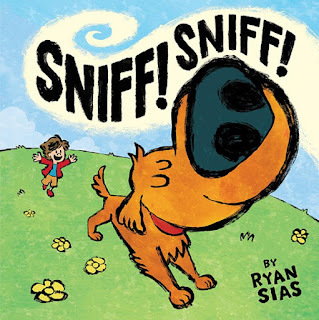 Kids' Book Review: Review: Sniff! Sniff! Sniff! Sniff! is the story of a cute and curious puppy whose nose leads him on a journey through the neighbourhood - and it’s one that wreaks havoc. It all starts at breakfast time, when - Sniff! Sniff! - the smell of bacon and other delicious treats entice the puppy from his position on a boy’s bed, into the kitchen where he devours the food - Chomp! Chomp! He’s soon distracted by smells from the garden and takes off outside - Dig! Dig! Along the way, and chased by his young owner, the puppy is continually diverted by new smells, meeting other animals and making a mess in a pile of garbage. Author and illustrator Ryan Sias uses his experience as a cartoonist and animator to good effect with bright, colourful illustrations. There are few words in the story, and those used follow a simple repeated pattern, making this a good book for pre-readers. Sniff! Sniff! will appeal to young children, especially those who love animals or have a mischievous streak.